We received a lot of feedback from our Kitely Market merchants that they want to see what their products will look like to buyers. So today we updated our system to allow merchants to use the Kitely Market search page, and to view the Product page and Store page that buyers will see. Since Kitely Market is still in pre-release mode, merchants can only browse their own stores, and non-merchants can’t browse the market at all. Furthermore, the Store and Product pages aren’t quite finished: for example, the Product page doesn’t show Customer Reviews yet, and doesn’t allow actually purchasing the product. Nevertheless, they’re close to what the final pages will look like. This page is fairly intuitive, but we’d like to point out a few highlights. The left side of the page contains various ways to filter the search results: by category, attributes, and other filters such as Currency, Maturity and Permissions. The list of available attributes changes depending on the selected category. 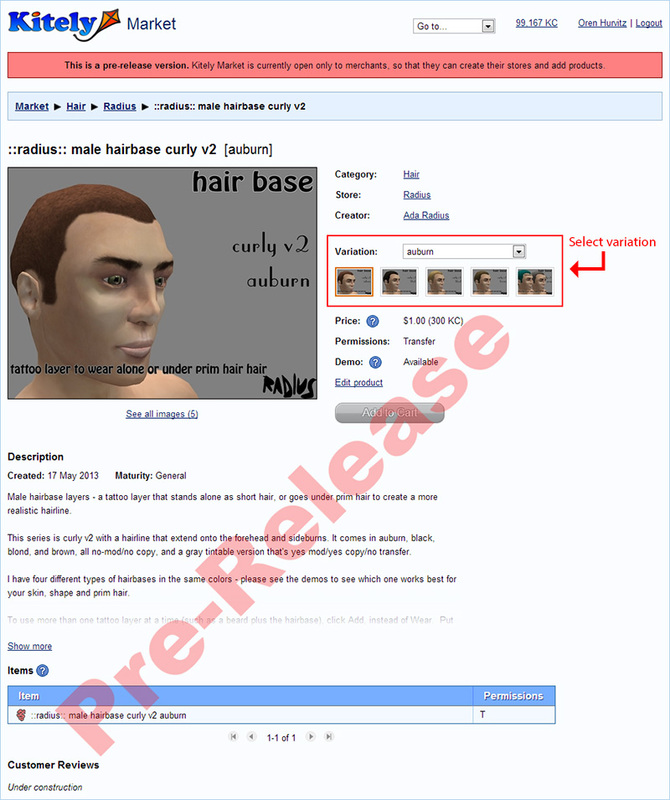 For example, the “Hair Color” attribute only appears if the selected category is “Hair”. A special kind of filter is the Store filter. Since Kitely Market is in pre-release mode, merchants can only search within their own store. This means that for now the Store filter is always present and can’t be removed. There are two product pages: Edit Product, which only the merchant can access, and View Product, which anyone can access (as long as the product is Active). When we use the term “Product Page” we mean the View Product page. You can access the product page either by clicking on a product in the Search page, or using the “View in market” link in the Edit Product page. In this screenshot, notice the area that is highlighted with a red rectangle. That is where you can see the available variations and switch between them. 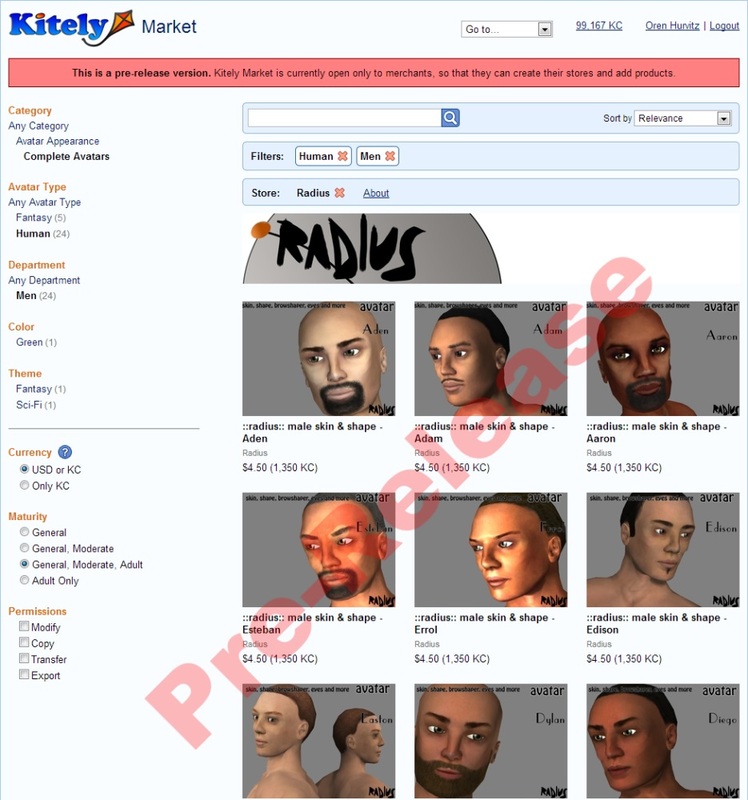 In this product, the user can choose between several hair colors. Notice how easy it is to see all the available variations and choose among them: it’s much more intuitive than having to deal with multiple products! The product page always shows the latest Active version of the product. If you’re currently editing the product then your changes won’t be visible in the product page until you save them. There are two store pages: Manage Store, which only the merchant can access, and View Store, which any user can access. To get to the Manage Store page, use the new “Go to…” listbox at the top of the screen (you can see it in the previous screenshots). The Manage Store page hasn’t changed much in this release: we just added one link to it, “View public store page”. This link leads to the publicly-available Store Page, which any user can see. The public store page can also be accessed by clicking on the store’s banner image in the Search page. With this release we’ve completed another big part of the Kitely Market, and it brings us one step closer to enabling content creators to easily sell to the growing OpenSim metaverse (currently comprising more than 300,000 registered users and 20,000 active monthly users). If you’re interested in selling virtual goods in the metaverse then make sure to take advantage of our special offer of free listings and a chance of becoming a Featured Merchant. This time-limited promotion will end soon, so act now and start building your Kitely Market store today!